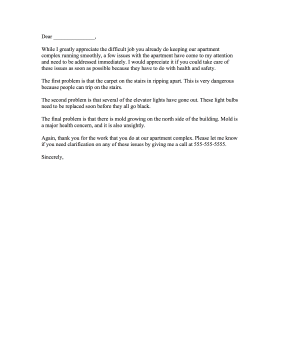 Politely and respectfully ask a landlord to deal with apartment issues in this tenant complaint letter. While I greatly appreciate the difficult job you already do keeping our apartment complex running smoothly, a few issues with the apartment have come to my attention and need to be addressed immediately. I would appreciate it if you could take care of these issues as soon as possible because they have to do with health and safety. The first problem is that the carpet on the stairs in ripping apart. This is very dangerous because people can trip on the stairs. The second problem is that several of the elevator lights have gone out. These light bulbs need to be replaced soon before they all go black. The final problem is that there is mold growing on the north side of the building. Mold is a major health concern, and it is also unsightly. Again, thank you for the work that you do at our apartment complex. Please let me know if you need clarification on any of these issues by giving me a call at 555-555-5555.